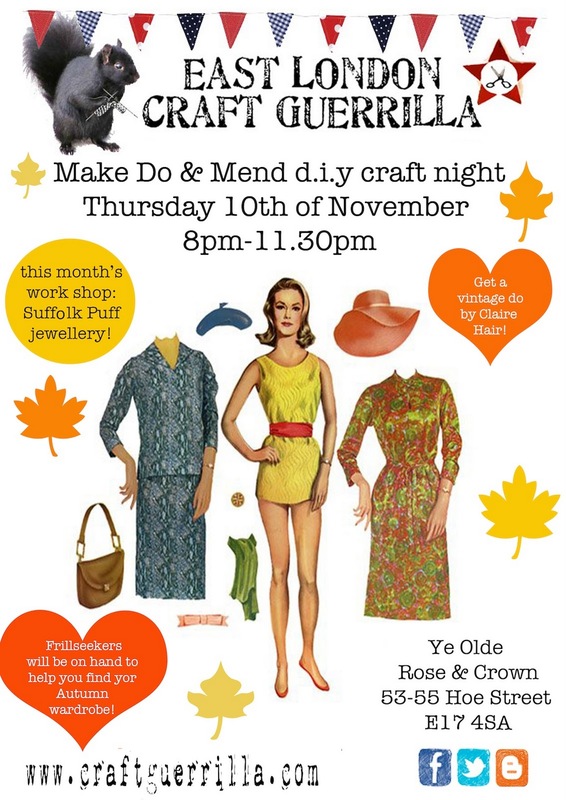 This November and December bring along to our d.i.y craft nights any unwanted craft materials which include fabrics,threads,wool,tools,vintage finds, jewellery bits,books,paper goods, etc. Because everyone's on a tight budget and if you're anything like me I'm sure you have hoards of left over bits which you don't use anymore so your trash can be "another man's treasure"! Because I'm in the middle of cleaning my workshop I've found that there is a lot, and I mean A LOT, of odds and ends which I will not be using and are just taking up space. The chances are that you also have some Crafty loot in your home and probably will never use so this is the perfect opportunity to swap and get your mittens on some useful bits for any last minute Chrimbo or even NEW YEAR projects. Remember to wash and iron any materials and all bits and bobs should be in fairly good re usable condition and clean. Please package your "Swaperamma" loot in groups in clear bags or jars. For example fabrics in one bag, buttons in another. For wool please bag these in groups of 4 ( bundles or balls of wool) so it's nice and fair when it comes to swapping. We'll get everyone to lay down their loot on a table and you'll be issued with tickets for what you have brought to exchange. From 9.00 pm you'll have 30 minutes to go through the bounty and spot anything you like. At 9.30 pm we'll officially open the "Swaperamma" and you can grab what you want according to the number of tickets you have. SO...If you have 5 tickets you can take 5 bags of CRAFT SWAG no matter what type of stuff you've brought in! If you've brought in buttons but need wool...swap it! We know that there might be a few choice bits which a couple or more people will want but...NO BUN FIGHTS PLEASE!!! If this is the case we'll do our best to be fair and split it between everyone or toss a coin if needed! We'd also like to remind you that any unwanted swag bags need to be taken back by their rightful owners please... though you might want to hang on to them for the next spate of Crafteramma Swapperamma events in 2012. A Horse and Donkey welfare charity which work closely with farmers, animal handlers in poor countries to educate people and treat working animals. Be inspired, make something original?! To say that everything is original would be as true as to say that the sky was coloured in pink and green polka dots! Nothing is truly original but what is important is that we as designers search out inspiration by looking at the world around us, look at the trends and even agree that it's perfectly OK to look at other people's creations in order to find a source of ideas but what we can not do is copy someone's work. I've seen so many cases where lazy designers trace other people's work, change a few colours then pass it off as their own original... like it's alright now, that changing a few minor details absolves them of any wrong doing. Selling it to big international chain shops as their own original art work when they haven't even broken into a sweat is embarrassing to say the least and not to mention shows a lack of belief in their own creative talents! 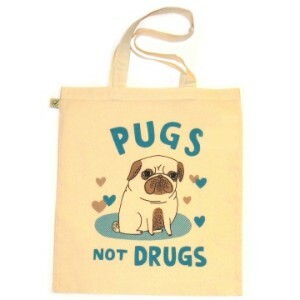 One that comes to mind is the "Pugs not Drugs" printed Tote bag by Gemma Correll and a chain shop which copied the illustration almost line for line. It's just shocking how they thought no one would notice especially when by being a "chain shop ' it means that inevitably they'll be selling that design on almost every high street including the one where the plagiarised artist might shop at. But it's not just on the High Street. Though we've seen how Paper Chase with their shabby track record on not checking up on their designers and how that has come back to bite them there are still lots of other culprits guilty of doing the same. Can we just point the finger at the big boys or is it also down to individuals? Laziness is everywhere and there's an increasing number of people who take free patterns and make from these to sell. OK so there is some degree of "universal use", it's understood that by giving free patterns that you are allowing people to make for personal use and then there's the grey area where it is alright to make to sell but with a little nod to the pattern maker. It's expected but what I wasn't expecting was the lack of creativity. What you then get are 100 sellers all selling crocheted Apple Cozies. All made with the same wooden button, same dusty pink cotton yarn and all because there was a freebie tutorial in a craft magazine. That's how they've seen them done on the sample picture and that's how they're making them! And when I say Apple Cozies I'm just using it as an example as all of a sudden after it appeared on a cover of a well known craft mag...there was an influx of listings on hand made selling/buying web sites of these items. Is there really such a high demand for crocheted fruit cozies? It's fine to be inspired by other people's work and yeah due to social references, to our experiences, shared global events and even down to your age that we will at some point over lap each other creatively but your work needs to be done in your style. Your own inimitable style which will allow people to identify it by just glancing at it...and that is original! Do you fancy dipping your toes into the tutoring and craft event assistant world? Well then...if you're a designer maker and fancy getting a taste of what it's like being a Craft Guerrilla then get in touch as we're on the hunt for helpers. We won't be expecting you to type nor will we ask you to perform boring admin tasks...this is a purely creative opportunity! Promise. If you're a dab hand at knitting, crochet, sewing, stitching and/or printing we'd like to hear from you. We need new craft packs to sell at our events and if you can supply and attend then you're the guy or gal for us. However you'll need to be LONDON based or willing to travel to the capital once a month in the evening. All monies you make form sales of your packs are yours to keep. As we're unable to pay a wage,we take no commission... so that's the dealio!!! There are a few new events in the new year so we're "Desperately Seeking Crafty Susan"! Also we need a few bands and DJ's for January and beyond so if you fancy laying down some crafty beats then give us a shout. Perfect for DJ's who'd like to cut their teeth on the wheels of steal or bands which are starting out!!! DJ's please let us know what type of music you play and bands...please send us your link or a demo. *Please note that we're unable to pay DJ's and bands for now but hopefully we will be able to in the near future! Advertise with us and get your crafty business seen! Help is at hand as we know just how difficult and expensive advertising can be! Because our readers are craft aficionados and lovers of all things hand made we might be just what you're looking for...plus we're not going to charge you a fortune!!! As part of what we do we are also in the business of helping independent creatives with PR and advertising. We serve not just as a public creative platform but also as a valuable resource for all designer makers and other talented folk. We are happy to share our space with like minded people! In the last 2 years we've had a huge growth in visitors and are also now selling our blog on Kindle as a subscription so a whole lot of new peepers are glancing at us!!! 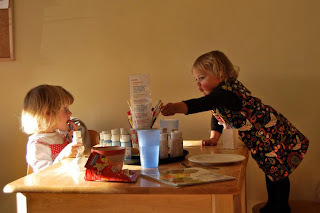 A lovely blog by a very talented lady and she's featured us! If you're a designer maker and would like to sell your wares at a fab little ceramics café in South Woodford then you really should read on. Creative Biscuit is a family run ceramics café which is co-run by a fellow designer maker Karen Dunn, aka Créme Anglaise, and her partner/fabulous baker Tim. They took over less then a year ago and apart from offering the whole ceramic café experience they also host our monthly "Crafternoon" and are now also offering craft workshops with designer maker tutors. So part of the new look and new management, Karen and Tim are very keen to open the café to designer makers and have a Gallery Shop area selling high quality hand made products. Autumn is firmly here and we're gearing up for some cozy crafting! Last spring there was the very good intention that fell to the way side, like most of them do in my case, of sorting out my winter wardrobe. Lots of moth action ensued during the last few years and though I had plenty of time to darn and sort out all my woolens but...well I'm sure you can work out what happened! So I will be bringing my holey jumpers to mend (better late then never!) and will be looking through the "Frill Seekers" boutique for some seasonal inspiration. The beret has been bought and the knitted snood has been started... woo hee it's gonna be a cold winter so get crafting! This month's mini workshop details to be announced soon but it's a very good make do & mend themed project! Let's just say Suffolk Puffs...yum lots of recycling! Also don't forget that Claire Hair will be there this month as unfortunately due to unforeseen circumstances she couldn't make it last craft night. But she's got her hair pins on stand by for the 10th! So get your selves down to the Rose & Crown, have a snifter of sherry, get a cute retro hair do, pick up a few crafty tips and a new "old" frock! With such fashionable offerings...We're going to rock these Autumn blues away!!! 4 solid days of CRAFT are now over! I must confess that even though I was shattered come Monday morning I got up and realized that I wasn't going to Ally Pally which did leave me wishing it was a week long show. BUT those 4 days were packed solid with crafty fun! So...I'll leave you with a few images of what we've seen at Ally Pally and if you haven't been...make sure you do next year! A big thank you to all our HELPERS and Volunteers that gave their free time to help us spread the word and also to the fantastic tutors that came to demo a few skills! Also to our designer makers...Thank you for bringing your lovely selves and your beautifully made hand made items. We hope you had some great sales and made some great contacts too. It was an absolute pleasure having you as part of Craft Guerrilla!!! Why is it important to price your hand made items appropriately? 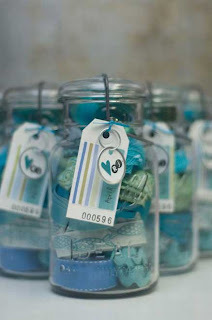 As a designer maker and a self employed business person you'll soon learn the importance of getting a few basics right! It may take more then one go and they might be the hardest lessons you learn but I hope that through my experience that you'll be able to hop, skip and fly over those little hard life lessons! When I first started selling my hand made products I fell into the trap so many other designer makers fall into. Pricing! Yep, it's an art in itself. My first day at Sunday Up-Market on London's Brick Lane was filled with excitement and also with a lack of self confidence. Once I set out my stall I went around to see what everyone else was doing and began to let the doubt creep in. Bad idea. Don't compare your work to anyone else's! So the questions began: "Was I charging too much for something which is very similar to that over there which is half the price? ", "Will anyone buy them…they might be too pricey?" , "Are they even any good to sell?" ETC. and I did the "newbie" mistake of lowering my prices. Prices which I had worked out and agreed on. In reality they were well priced. Actually once I had the same products stocked in Benetton in Lisbon they priced them up three times more then what I was asking for them and they sold. Like hot cakes! Because I wasn't confident and felt pressured into making sales in order to pay for my pitch I sold my items for way less then they actually were worth. It wasn't even enough to cover materials! It was a struggle and I spent any free time mostly after a full time job making up stock to just about break even. Lots of people got really good bargains that year! one - you pay your self a fair wage and keep funding your hand made company. This can be after all your career! two - you don't diminish your work and everyone else's by underselling a hand made item. It makes it so much harder to sell your items which have been made with lots of love and care if the person next to you is selling a "just as beautifully hand made" product for next to nothing! One of my bug bears is seeing gorgeously designed hand crafted items which are undervalued because there's this lack of belief in hand made products, their importance, place in the economy, sustainability and their value. It's perfectly fine to make because you like making but please don't sell your products for "pound shop" prices. If you are crafting because you find it is a release and/or a curative pastime then there's always the option of setting up a workshop where you can teach and share your passion. Lots of craft cafés, craft markets and collectives are paying for tutors as are local charities. Working with the community might just be as rewarding if not even more so keep an eye out as there might be a creative projects you can volunteer your time and skills to. So OK why are you going to sell your items at a premium price? To say that you really needn't the money and are just happy to make is an inexcusable,selfish action as many talented and struggling designer makers need to make their money by selling their craft. Not everyone has a husband or partner that can sustain a household and your hobbies on just one wage. With the creation of market spaces like Etsy and Folksy, to name but a few, which work both as a platform for creatives to sell their goods and a buying space for craft lovers it has also successfully highlighted a popular alternative to High Street shopping. BUT in all honesty it's also a double edged sword. For example as a company Etsy does just that: provides a vibrant, attractive, creative buying and selling space. It's a an all singing all dancing shop front for everything and anything hand made, promoting it heavily as something special and that cool kids will want to buy... and they do that very well too... but there's little or no pre vetting so anyone can add anything to it. Needless to say that just because someone makes something that it doesn't mean it's worthy of being called a CRAFT item. The trouble with pulling all this creativity under the hand made banner is that it fortifies the misconception that it's not a serious business...that it's all about glitter,sparkles and macaroni stuck on card with PVA glue! Hey I love a bit of nursery crafting as much as the next but these types of crafts need to be kept in their rightful place. In the home. I've just seen too many items on these sites that are absolutely substandard,badly designed and badly conceived. Hand Made needs to be perceived as serious industry and a luxury product . If people want a cheap gift then mass production fills that brief. We need to treat hand made goods unlike mass produced goods and start pricing products fairly and realistically. It is after all a premium product because of the nature of it. Hand made means it will take longer to make there fore the the manufacture rate will be higher. It doesn't mean that everything you make needs to be expensive and exclusive. It's all about working out exactly what is realistic to make to sell, what is viable for you as a maker to produce, what the demand is and what will earn a fair profit for you. So how do you price your products correctly? First you'll need to set your self a rate or a wage IE what you are paying yourself per hour or per item. Then you'll need to factor in your materials and this goes from the actual materials used (fabrics, silver, wool etc) down to your electricity for your lighting, your computer, the time you spend trawling the internet for these materials or the train tickets you've paid to go into town to buy that button you desperately need for that item, use of tools, the use of your sewing machine and even the thread you used on that sewing machine! Personally I work out all the material costs and multiply that by three. I can factor in the time and everything individually but I've found that it works out pretty close. You'll find your own formula. How you work it out is up to you and there are quite a few web sites with great advice which can help you make sense so have a look. It's not all about hard nosed business practices and I do believe there's enjoyment too even if you are aiming to create a successful hand made company...but it is a business after all (if you want it to be of course! ).